The first question many people will have is: What is this “Pecha Kucha” thing after all? And as I mentioned in my profile, one of my interests is presentations. In short; pecha kucha is a presentation technique where every slides lasts exactly 20 seconds with 20 slides in total. The motivation for this comes from the lecture Mobile Human Computer Interaction by Enrico Rukzio where the exercises demand such kind of presentation. But I will not go into much detail about this, the more important questions is: Does the current presentation-programs feature this technique? And the answer is: Yes, but often presentations are held with PDFs which do not feature it. which allows you to send keystrokes system-wide! Yes, pretty cool; and it works for Windows, Linux and Mac. This also explains the way I implemented it. Just sending Page-Down keystrokes to the system, when the presentation is running. This will click the next slide in a given amount of time automatically. Page-Down because most hardwarepresenters also use this keystroke to fulfill their purpose. This post is about how I program little applications and should give everyone a little look how I write code. One important thing I learned at the University is the importance of requirements and software engineering. In short: Think about what you do, the program must exist in your head (or at least on papers and diagrams) before a single line of code is written. Even is such small programs like this one. The first thing we need to know is, what should your program do, and more important, what should it not do! So, we need a program that should automatically switch slides on a presentation in a given amount of time. The program should work with most OS and most presentation-programs. Controlling the program should be possible via a Trayicon and Formdialog. Every controlling-element should indicate if the timer is started or stopped. Before the program should switch slides, the user must have some time to prepare for his presentation. Therefore a delay should be implemented that starts the input-automation after a fix amount of time. The program should always give responses to the internal state, like: How much time is left before the presentation starts and how long will the current slide last until a switch. Also it should be possible to pause the program while in presentation. If the presentation has ended, you should be able to start over. It should be possible to set parameters for: Delay-before-presentation, Time-for-each-slide, Amnout-of-slides-in-total. The requirements could be more precise, but that should be enough. The next thing is to think about how to implement it. Usually you draw nice diagrams like Class-diagrams and state charts. 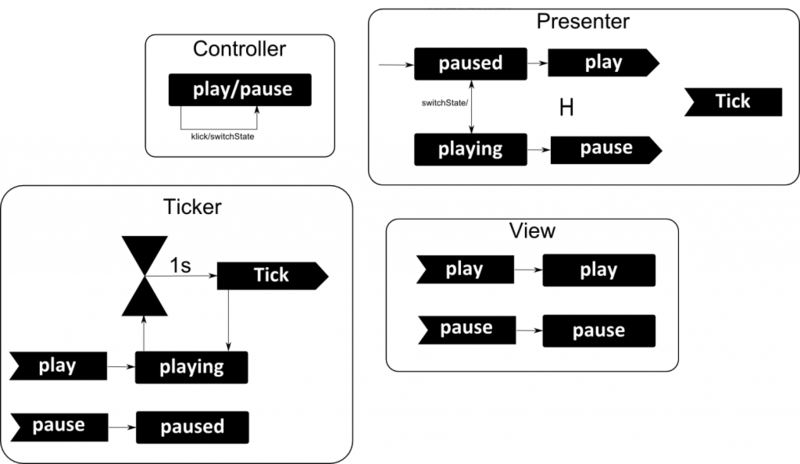 As we can see in the diagrams above, the Presenter is our Model (the M in MVC), Tray and InfoDisplay are Views but also Controllers. 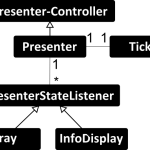 If we switch the state of our Model via the Controller, the Views (which implement the PresenterStateListener) are updated automatically. As timer I used a Ticker-Class which just calls a callback in the presenter ( tick() ) every second. The ticker can be in play or in paused state. 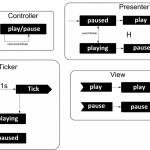 PresenterController implements the Play/Pause state machine and the Listeners, Presenter implements the delay/next-slide state machine. But enough about intention, requirements and design, let’s go see some code! This part should be obvious. 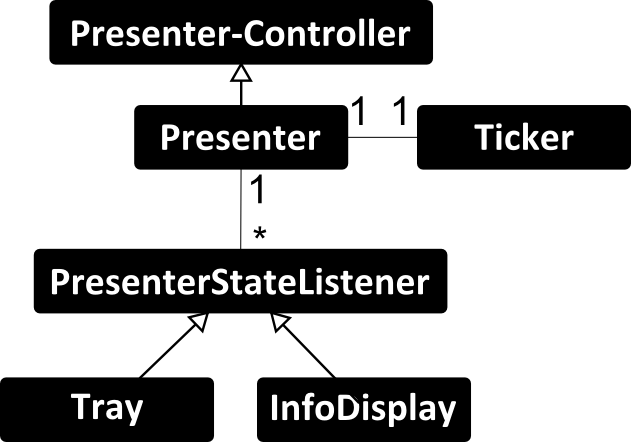 We control alternative parameters via command-line args, then delegate everything to the Presenter. After that, we create the Views and connect the Listeners. Let’s have a look into the Tray-Class, which I developed first, because it’s often easier to begin with a controlling element like a GUI. This allows you to implement the use-cases defined in the requirements-part and also allows you to find errors and misunderstandings between Customer and Contractor in a very early state of development. If all interactions are implemented, you can run usability-tests with real users. But personally I think beginning with controlling elements allows you develop an early logic which can be very good integrated into the final program. //this is a nice way to access ressources in the jar-file. But this also works in the normal filesystem. The Trayicon should be very straight forward, there should be no problems to understand the code here. * and how many slides are left. //interesting things could be the String.format() method, which works like c's printf. Also nice is the usage of html and css to style the Label. On top of that, I created the Presenter class which uses a Ticker to time events. Every second the ticker calls the tick-method of the presenter. The presenter then decides what to do: Delay the presentation, count down the slide-timer or use the robot to send a “next-slide”-keystroke to the operating system. * The main control class for presentation. * Implements the next-slide, presentation starts, ends state machine. msgPresenterStateListeners("Seconds until next slide: "
Then there is the Ticker class. The idea of the ticker is, that he has three states: PLAY, PAUSE, STOP. However STOP is never active because it would prevent the ticker from starting over. Once the run-method has ended, a Thread will never be alive again..
*  on Pause, the ticker-thread will be on wait. *  On Stop, the Ticker can never be in play or paused state again. //in short, use it to indicate that multiple threads will access it. 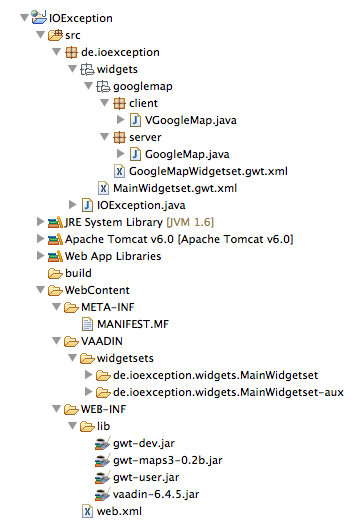 //Also note that the definition of volatile tightened up in java5. ownThread.setDaemon(true); //a daemon-thread will not cause the program to stay alive if no other thread is running. //again, we need to synchronize this on ownThread because ownThread.wait(); demands this. The idea is to loop infinitely if the ticker is in PLAY, and to pause the whole thread if it is on PAUSE. On STOP, we end the infinity-loop in the run-method. You also see that I use timestamps to trigger events not Thread.sleep(TIME) to do that. The reason is that Thread.sleep is only as accurate as the precision and accuracy of systemtimers and schedulers. By checking everytime if the delta-value of the system-time is greater or equal than one second, we should be very precise. So what happens if we pause the timer? The Thread checks in a loop every time if we are in paused state. If that is true, he puts himself to sleep. The call ownThread.notifyAll(); in play() wakes him up. Im Rahmen der Vorlesung “Mobile & Ubiquitous Computing” (bin derzeit mitbetreuender Hiwi) waren wir auf der Suche nach passenden Übungsaufgaben. Eine Übung davon sollte verschiedene Aspekte aktueller Mobilapplikationen (Sensorkontext, Web Services, Live Notifications) einbeziehen, ohne dabei allzu komplex zu werden. Als ansatzweise reales Szenario hierfür dient die Mensa. Zu Stoßzeiten ist es häufig schwierig, in einer größeren Gruppe gemeinsam zu essen. Spätestens an den Kassen teilt sich die Gruppe auf und es ist schwierig, die Anderen zu finden. Ein Teil sitzt vielleicht auch schon an irgendeinem Tisch, während andere immer noch an der Essensausgabe warten. Was man also unbedingt braucht, ist ein Mensafinder. Der Mensafinder ermöglicht es, anderen seine grobe Position in der Mensa mitzuteilen oder aufzuzeigen, wo andere Leute sitzen. 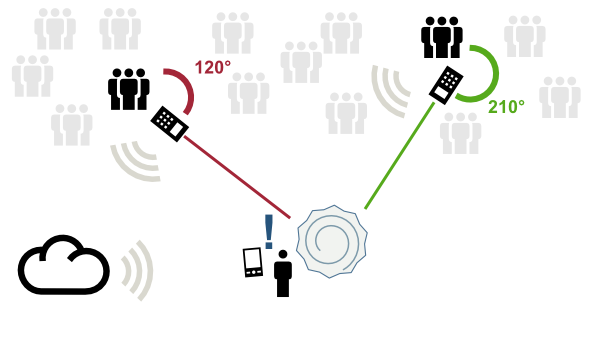 Aufgrund der Einschränkungen vor Ort (kein GPS-Empfang, WLan-Ortung zu ungenau) haben wir uns auf eine einzige Kontextinformationen beschränkt, die bereits eine ausreichende Lösung bietet – die Kompassausrichtung. Anstatt die genaue Position zu ermitteln, verwenden wir eine grobe Richtung abhängig von einem Fixpunkt im Zentrum des Raums (Wendeltreppe). Bereits sitzende Personen richten ihr Mobilgerät in Richtung des Fixpunktes aus, suchende Personen können ausgehend vom Fixpunkt den Richtungen folgen. Technisch besteht der Mensafinder aus einem Webservice und mobilen Anwendungen. Der Webservice basiert auf REST und bietet als besonderes Feature das ‘Streamen’ neuer Events (neue/aktualisierte Peilungen oder Abmeldungen). Hierfür wird durch den Client eine HTTP-Verbindung geöffnet und serverseitig nicht direkt geschlossen. Stattdessen werden neue Events via Chunked Encoding in die offene Verbindung geschrieben, ähnlich wie bei Streaming API von Twitter. Der Service wurde mit node.js implementiert, Quellcode sowie Dokumentation der REST API sind auf github verfügbar. Da es sich nur um eine Demo-Applikation handelt, fehlen einige wichtige Features. Es gibt keine Authentisierung der Benutzer und es werden alle Peilungen aller Benutzer übertragen (es gibt keine Kontaktlisten). Interessant wäre natürlich die Anbindung an bestehende Dienste, die bereits eine Authentisierung und Kontaktlisten bereitstellen, so wie beispielsweise Facebook Connect. Obwohl moderne Plattformen wie Android und iOS als auch alternative Ansätze wie mobile Webanwendungen zunehmend den Markt mobiler Applikationen beherrschen, spielt auch nach über 10 Jahren Java ME noch eine Rolle in diesem Bereich. Vor allem für Nicht-Smartphones und Low-End-Geräte ist Java ME eine verbreitete Technologie. Dieser Beitrag soll erläutern, wie man mit Java ME Anwendungen implementieren kann, die aufwendige oder länger dauernde Operationen im Hintergrund ausführen und somit eine “responsive” GUI bereitstellen. Bei interaktiven Anwendungen, die Inhalte aus dem Internet laden oder komplexe Berechnungen durchführen, ist es besonders wichtig, die Benutzerschnittstelle durch diese Aktionen nicht vollständig zu blockieren. So können zum Beispiel HTTP Requests in mobilen Netzwerken mehrere Sekunden benötigen – die Anwendung sollte trotzdem benutzbar bleiben oder zumindest dem Anwender über den Ladevorgang informieren. Wie auch bei Desktop-Applikationen liegt hierbei der Schlüssel im Umgang mit Nebenläufigkeit. 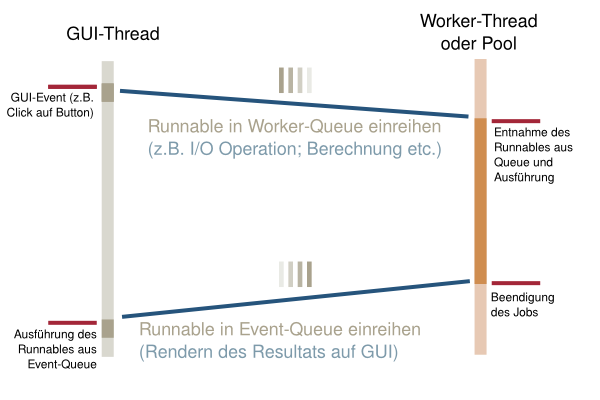 So wie es in gewöhnlichen Java-Anwendungen mit GUI einen AWT-Thread gibt, der mit einer Event-Queue auf GUI-Ereignisse wartet und diese verarbeitet, gibt es auch in Java ME ein ähnliches Konstrukt für die Benutzerschnittstelle. Wichtig ist es nun, länger dauernde Operationen nicht in dem jeweiligen Thread auszuführen, sondern in einem separaten Thread. So können auch weiterhin GUI-Ereignisse abgefangen werden, auch wenn die Operation noch andauert. Die eigentliche Aufgabe – I/O Operationen, Berechnungen etc. – wird in einem eigenen Thread oder einem Pool von Threads durchgeführt. Die Aktion wird aus dem GUI-Thread heraus gestartet (z.B. nach dem Click auf einem Button), allerdings eben nicht im GUI-Thread, sondern separat. Somit wird das Starten der Operation asynchron und somit nicht blockierend durchgeführt, und auch mit dem Resultat sollte ähnlich umgegangen werden. Das Ergebnis der Operation sendet nach Bearbeitung das Ergebnis wiederum an den GUI-Thread, der dies dann darstellt. Für den letzteren Fall gibt es bereits ein fertige Methode: javax.microedition.lcdui.Display.callSerially(Runnable r). Diese Methode reiht das angegebene Runnable an das Ende der Event-Queue ein. Der GUI-Thread arbeitet wiederum die Events und Runnables der Reihe nach ab. Für das Absenden von Hintergrundaktionen aus dem GUI-Thread bietet sich ein ähnliches Vorgehen an: Mithilfe einer blockierenden Queue sollten neue Runnables angelegt und eingetragen werden. Ein Thread oder ein Pool von Threads sollte nun aus der Queue lesen und die dortigen Runnables ausführen. Am Ende der run()-Methode jedes Runnables sollte nun das Resultat der Aufgabe wieder an die GUI zurückgegeben werden. Hierfür ist nun die Display.callSerially(Runnable r) hilfreich. Wer gerade dabei ist, eine Anwendung mit dem Web Application Framework Vaadin zu realisieren und darüber hinaus beabsichtigt, Google Maps in sein User Interface zu integrieren, hat mehrere Möglichkeiten. Jetzt hat man zwei Möglichkeiten: Entweder man wartet bis Google offiziell eine Library für die Version 3 zur Verfügung stellt, wozu es allerdings keine genauen Angaben gibt, wann das geschehen soll, oder aber man verwendet einfach die Alpha-Version der besagten GWT Library, die auf einer inoffiziellen Seite von Google zu finden ist. Wer genug Zeit zum Warten und sich aus diesem Grund für die erste Möglichkeit ent- schlossen hat, braucht nun eigentlich nicht mehr weiterzulesen ;-) Allen Anderen soll nachstehend am Beispielprojekt IOException gezeigt werden, wie man das Grundgerüst für sein eigenes GoogleMap Vaadin Widget mit Hilfe der GWT Library gwt-google-maps-v3 (Alpha-Version) erstellt. Anmerkung: Im Folgenden werden lediglich die essenziellen Schritte aufgeführt. Für die Grundlagen zur Erstellung eines Vaadin Projekts wird auf das Book of Vaadin verwiesen, das vor allem für Anfänger sehr empfehlenswert ist. Zuerst erzeugt man ein gewöhnliches Vaadin Projekt und legt daraufhin die im Screenshot dargestellte Projektstruktur an. Die JAR-Datei gwt-maps3-0.2b.jar (GWT Library) kann in der Rubrik Downloads der bereits erwähnten inoffiziellen Seite von Google heruntergeladen werden. In der Manifest-Datei muss durch das Attribut Vaadin-Widgetsets angegeben werden, wo sich der oberste GWT Modul Descriptor befindet, welcher das zentrale Widget Set definiert und auch als Einstiegspunkt zum Kompilieren dient. Dies muss zusätzlich im Deployment Descriptor als <init-param> innerhalb der <servlet>-Tags aufgeführt werden. das gezeigte Beispielprojekt jedoch nur das GoogleMap Widget beinhaltet, ist dies hier auch die einzige Angabe. Die Klasse GoogleMap.java ist an dieser Stelle nur der Vollständigkeit halber aufgeführt und bedarf eigentlich keiner weiteren Erklärung, da dies der gewöhnliche Aufbau einer serverseitigen Widget-Klasse ist und erst einmal nicht erweitert werden muss. Wie hier zu sehen ist, kann das GoogleMap Widget nun völlig unkompliziert verwendet werden. Als Beispiel dient dafür die Anwendungsklasse IOException, in der das initialisierte Widget einfach zum Main Window hinzugefügt wird. Das Web ist mit HTTP fest an ein Client/Server-Modell gebunden und eine dadurch implizierte Asynchronität der Kommunikation. Requests können ausschließlich von Clients initiiert werden und immer von Servern in Form von Responses beantwortet. Ein solches Modell ist ausreichend für den Abruf von Informationen, setzt allerdings Schranken bezüglich anderer Interaktionsformen. Andere Protokolle wie XMPP, SIP oder auch Technologien wie nachrichtenbasierte Middlewaresysteme besitzen oft keine so deutliche Trennung zwischen Client/Server und erlauben weniger eingeschränkt die Kommunikation zwischen Knoten. Dadurch enstehen neben dem Request/Reply Muster weitere typischen Muster für den Austausch von Nachrichten. Ein Muster für die Benachrichtigung über Ereignisse ist das Publish/Subscribe Muster. Interessierte Knoten subskribieren sich für bestimmte Ereignisse und ereigniserzeugende Knoten publizieren diese. Ein solches Kommunikationsmuster ist mit HTTP direkt nicht möglich, auch wenn es insbesondere für Feeds interessant wäre. Zwar bestehen mit Server Pushes / Long Polling oder dem aufkommenden WebSocket Standard vereinzelte Lösung für das prinzipielle Problem, dass HTTP keine serverinitiierte Kommunikation erlaubt, jedoch sind diese Insellösungen bisher kaum in der Breite verwendbar. Google hat mit dem PubSubHubbub-Protokoll ein einfaches offenes Protokoll erschaffen, dass auf reinem HTTP basiert und ein solches Publish/Subscribe Muster unterstützt. Der Trick hierbei ist die Tatsache, dass alle beteiligten Knoten selbst sowohl Server wie auch Client sind und somit sowohl Requests empfangen wir auch versenden können. Im Rahmen des diretto Projekts habe ich für unseren Client eine java-basierte Subscriber-Implementierung entwickelt. Als Feed kann jeder PubSubHubbub-fähige Atom-Feed benutzt werden. Im Falle einer Änderung des Feeds, zum Beispiel der Veröffentlichung eines neuen Eintrags, wird das “Delta” des Feeds, also der neue Teil an die Callback-Methode übergeben. Der Client benutzt intern Rome für die Auswertung der Atom-Feeds und Jetty als leichtgewichtigen, internen Webserver. Der Subscriber muss übrigens für den Hub erreichbar sein, insofern sollte er an eine öffentliche IP und den angegebenen Port gebunden werden. Für die Interaktion mit Feeds gibt es in Java die weit verbreitete ROME-Library. Diese Library unterstützt sowohl RSS als auch ATOM in den verschiedenen Versionen. Außerdem bietet es eine Abstraktion an, die den Umgang mit den verschiedenen Feedarten vereinfachen soll. Ihre sogenannten Syndication Feeds bieten eine einheitliche Schnittstelle an, und sind unabhängig vom darunter liegenden Format. Dies mag allgemein sehr hilfreich sein und für viele Fälle auch ausreichen. Typische Operationen sind somit entkoppelt vom Format und können wiederverwendet werden, oder das konkrete Format kann problemlos ausgetauscht werden. Der Nachteil hierbei ist, dass bei dieser Abstraktion Besonderheiten der einzelnen Formate verborgen werden. Problematisch wird es zum Beispiel, wenn man explizit ein bestimmtes Format lesen möchte, um auf bestimmte Elemente zuzugreifen. So muss in Atom jeder Feed und Einträg ein ID Element besitzen, in RSS existiert dies jedoch nicht. Leider existiert nun auch keine Methode, ein solches Feld in einem Syndication Feed direkt abzufragen. Anders als manch andere imperative Programmiersprachen, unterstützt Java nur die Rückgabe eines Wertes bei einem Methodenaufruf. Jedoch ist es häufig interessant, mehrere Werte zurückzugeben. Grundsätzlich lassen sich hier zwei Szenarien unterscheiden. Bei der Rückgabe von mehreren gleichartigen Typen wird meist eine Klasse des Collections-Frameworks verwendet, wie zum Beispiel List oder ein Array. Manchmal will man aber auch völlig verschiedene Typen gemeinsam zurückgeben. Gängige Praxis ist es hier, ein Object-Array zurückzugeben und dann quasi beim Implementieren festzulegen, von welchem Typ die einzelnen Werte sind und entsprechen zurückzucasten. Dies ist leider weder typsicher, noch lässt sich die vorherige Festlegung im Code erzwingen. Abhilfe schafft hier eine generische Holder-Klasse, die einzelnen Werte typsicher kapselt und als einziger Rückgabewert verwendet werden kann. * Immutable holder type for two values. Die Holderklasse lässt sich auch noch beliebig erweitern, um Tripel, Quadrupel etc. zu halten. Wer für 2-Tupel keine eigene Klasse implementieren möchte, kann übrigens auf AbstractMap.SimpleEntry oder AbstractMap.SimpleImmutableEntry zurückgreifen.